Machines will be capable of carrying out half of all work tasks by 2025 — equating to the loss or displacement of 75 million jobs. But, in the same period, 133 million human jobs will be created. Why? Because jobs that require a high degree of repetitive tasks — like loan officers, receptionists, and retail salespeople — have a high probability of becoming automated in the next few years. Certain jobs are going away, while others will begin emerging at an unprecedented rate. Some job titles that are predicted to emerge include AI Lawyer, Drone Pilot, Digital Archaeologist, Tech Ethicist, Chief Trust Officer, and AI-Assisted Healthcare Technician. It’s not like you’ll be able to hire someone with a Masters in “trust” or 10 years experience in Healthcare AI. That’s why you’ll notice that the in-demand skills listed above are not the typical required credentials listed in a job description today. These are typically referred to as “hard skills” — whether you have experience using a certain Customer Relationship Management (CRM) software, coding in a certain language, or if you have a particular degree or certification. In the future of work (or what many are calling "The Fourth Industrial Revolution"), jobs that we will never see coming will emerge at a rapid pace. The “correct” career path or education of an ideal candidate to fill these roles won’t be obvious. We will need to quantify people’s human skills in order to place people into jobs; not only are these skills transferable across unconventional career paths, but these uniquely human skills will be the ones protected from automation. So let’s dig into why experts are unanimously agreeing that the skills listed above will be the standout skills in the future of work. Chances are, you haven’t yet come across a robot makeup artist or novelist. Unsurprisingly, we won’t be able to automate creativity anytime in the foreseeable future. The skills we have identified as the standout skills in the future of work are not meant to be listed in any order, except perhaps creativity. McKinsey, The Harvard Business Review, Deloitte, and the World Economic Forum have all listed creativity as a skill that will be in high demand in the oncoming years. Hence why creativity made the top of our list. Creativity is a high cognitive skill. McKinsey places it above advanced literacy and writing, project management, and complex information processing and interpretation. McKinsey estimates that the demand for creative skills will increase by 19 percent in the US and by 14 percent in Europe, from sizable bases today. According to the World Economic Forum, jobs requiring problem-solving that will emerge in the next few years will involve identifying complex problems and reviewing related information to develop and evaluate options and implement solutions. People expect to be able to find good jobs with greater capacity for creativity and problem-solving: a future of work in which humans and machines work together to help find solutions for many of our organizations’ most pressing problems. Human and machine intelligence can be considered different in complementary, rather than conflicting ways. While they might solve the same problems, they often approach these problems from different directions. It won’t be humans vs. machines, but about finding the right combination. The World Economic Forum found that, alongside other roles that leverage distinctively human skills (like Customer Service Workers, Sales and Marketing Professionals, Training and Development, and People and Culture), “Innovation Professional” is an emerging role in the future of work. This type of job will require creativity and alternative thinking to develop new ideas for answers to work-related problems. In the same report, the World Economic Forum found that by 2022, no less than 54% of all employees will require significant re- and upskilling. Innovation is one of the skills expected to grow in prominence by 2022, and therefore many workers will require learning & development opportunities specifically targeted at fostering innovation mindsets and skills. As automation and AI continue to advance in the Fourth Industrial Revolution, human critical thinking will increase in demand. Robots are optimized to make decisions based on patterns of past human behavior but are not yet capable of bringing human ethics and better judgement into the equation. AI, when left to its own devices, can go south quickly. To illustrate, we can learn from the mistakes of Amazon. In late 2018, information leaked that between 2014 and 2017, Amazon tried to build an algorithmic system to analyze resumes and suggest the best hires. It failed. After Amazon trained the algorithm on 10 years of its own hiring data, the algorithm became biased against female applicants. The word “women,” as in “women’s sports,” would cause the algorithm to rank applicants lower. When human critical thinking is left out from the AI training process, it’s called Black Box AI. We trust the algorithm’s output without “looking under the hood” to understand how the AI came to a particular conclusion. Human critical thinking will be necessary to influence algorithm decision-making and rectify poor AI decisions that counter human ethics, such as replicating bias. 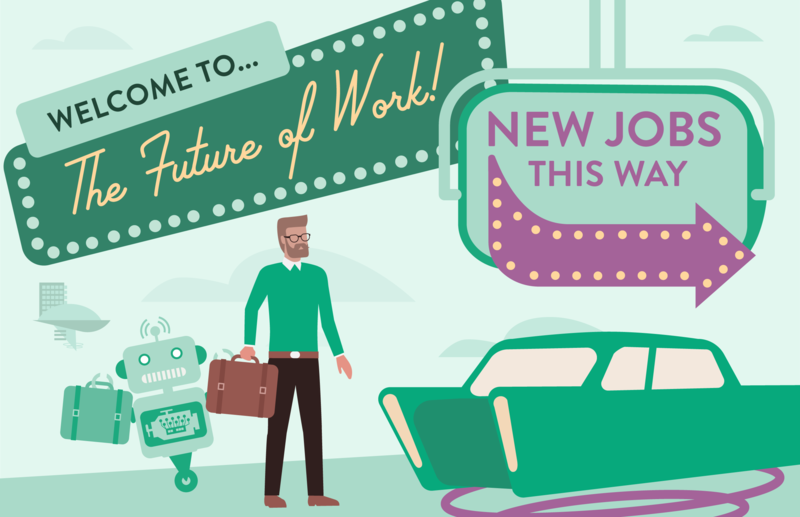 In the future of work, net new jobs will be created at the same rate (or even faster!) as dying jobs. Distinctly human skills — creativity, problem-solving, innovation, and critical thinking — will grow in demand as jobs that require repetitive and mundane tasks are overtaken by automation. Organizations that get a head start in quantifying these talents in their workforce now, and provide strategic learning & development opportunities to upskill these human talents in their workforce today, will acquire a competitive advantage as we step into the Fourth Industrial Revolution. Measuring the innate talents of your entire workforce can feel like a daunting and overwhelming task — but it doesn’t have to be. Read our Talent and the Future of Work Essential Guide to get ahead of the competition and ensure your talent strategy is future-ready.